Tokyo University of Agriculture is well noted for "Daikon Odori", the Japanese radish dance, which calls to mind cheerleading for the Hakone ekiden (a long-distance relay road race). Holding up pragmatism as its vision, the Univ. is also known for its unique and high specialization as well as its school traditions of simplicity and fortitude established through education and research in agriculture and the surrounding fields. Dept. of Landscape Architecture Science, Faculty of Regional Environment Science advocates making a contribution to the global environment through regional actions, while directly involved with coexistence of human beings with nature. This issue picks up "Lab. of Landscape Engineering, Dept. 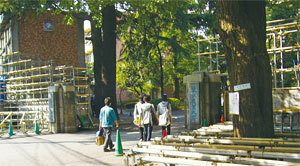 of Landscape Architecture Science", which explores engineering approaches in the Faculty. 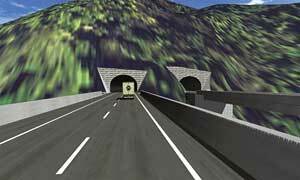 We especially focus on its efforts to aim at research and development of new applications relating to landscape, based on a great store of knowledge towards CALS/EC (Continuous Acquisition and Life-cycle Support / Electronic Commerce) for highway projects. Belonging to Dept. of Landscape Architecture Science with landscaping as its core, the Lab pays attention to the aspects of its design and construction. Using the term "Landscape" as a common key word, various kinds of research are going on according to the different specialties of faculty staff members. Considering these circumstances, the Lab is trying to develop new approaches of designing and constructing landscape spaces including civil engineering structures such as roads, making free use of information technology (IT). One of those efforts is linking "OHPASS (Optimal Highway Path Automatic Search System)", an optimization approach in the highway route selection process using a genetic algorithm, with simulation technology. As a tool to realize this, the Lab focused on "UC-win/Road", 3D real-time VR (virtual reality) software of FORUM8. At present, joint development is going on towards its actualization. We interviewed Dr. Motoya Yamasaki, Associate Professor of the Lab, who proposed this idea and is leading the Lab. Tokyo University of Agriculture originates from the agricultural course in Tokugawa lkueiko School under Tokugawa Ikuei Kai Foundation established in 1891 by ENOMOTO Takeaki, who was active from the last days of the Tokugawa government through Meiji era. It was the result of consideration that it was essential to develop domestic agriculture, and accordingly to educate farmers in order to raise the national power after the Meiji Restoration. In 1893, the agricultural course became independent from the Tokugawa Ikueiko School as Tokyo Nogakkou (Tokyo Agricultural School). After that, through reforming and changing the organization, it became Tokyo University of Agriculture Foundation under the University Enactment in 1925, followed by the present Tokyo University of Agriculture Educational Corporation founded in 1949 under the School Education Law. Today, reflecting the changing times surrounding agriculture, Tokyo University of Agriculture (TUA) has 3 campuses in Setagaya Ward (Tokyo), Atsugi City (Kanagawa), and Okhotsk (Hokkaido), where Faculty of Agriculture, Faculty of Applied Bio-science, Faculty of Regional Environment Science, Faculty of International Agriculture and Food Studies, Faculty of Bio-industry, and Junior College of TUA are located. 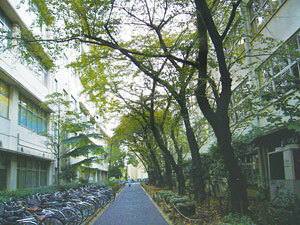 Faculty of Regional Environment Science, which is featured this time, was established in 1998 at Setagaya Campus, by reorganizing Faculty of Agriculture at that time, consisting of 3 Departments of Forest Science, Bioproduction and Environment Engineering, and Landscape Architecture Science. Its visions are: merging specialized technologies, such as forestry, agricultural engineering, and landscape architecture, with sociological studies, as well as attempting conservation and improvement of environment depending on individual regions of mountain villages, farm villages, and cities. Above all, the subject of research for Department of Landscape Architecture Science is design and construction of environment where people and nature can live together, ranging from gardens, parks, and urban spaces to farming and mountain villages. Further, "Lab. of Landscape Engineering" states that its mission is to explore landscape engineering with living-together and creating-together styles, considering sustainable development. "'Landscape' includes a wide range of elements such as scenery and material shaping. For this Lab at present, this is a subject like the greatest common measure." Associate Professor Motoya Yamasaki, who took up his present post in the spring 2007, mainly takes charge of the fields of design and construction of civil engineering structures, based upon his experience in his previous workplace, Central Nippon Expressway Company Ltd. (NEXCO Nakanihon). For instance, he says that he has a seminar class of CAD considering support for CALS/EC. On the other hand, with respect to landscape, he puts an emphasis on research relating to effective use of CALS/EC data, such as landscape analysis by using IT. One of the research subjects which Associate Professor Motoya Yamasaki has been jointly going on with is "OHPASS". Originally in the process of deciding road alignment of expressways, it is required to consider various assessment items such as economic efficiency, safety, roadability, decrease of environmental stresses, in addition to fulfilling not only the direct purposes of the project but also provisions of Road Structure Ordinance and other relating guidelines and standards. Actually however, it isn't uncommon that after the road alignment is decided, it is required to be changed at the stage of environmental assessment or local consulting. In such a case, it takes much time and trouble to draw a new road alignment, causing problems such as the delay in the project. Accordingly, it was required to devise an approach for examination which enables flexible and quick simulation of road alignment at the design stage. Consequently, Mitsubishi Research Institute, Inc. undertook its development in 2000.as a commission by then-Japan Highway Public Corporation (JH) Laboratory (presently Nippon Expressway Research Institute Company Limited) to, In the process of modeling vertical and horizontal alignment, and evaluating and optimizing the alignment designed based on the alignment model, it was planned to adopt a transit point model and a genetic algorithm. 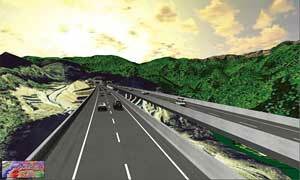 This led to construction of "OHPASS", an optimal road alignment search system that enables simulation and evaluation of road alignment design on the digital topographic data and consequently reduction in project cost and improvement of the balance of the amount of earthwork. 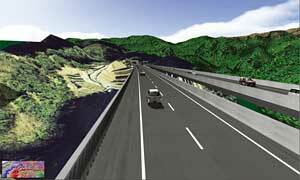 At the same time it was confirmed that the DM (digital mapping) data could be taken into OHPASS by linking it with 3-dimensional CAD. This was also made into a tool. Besides, it was assumed that in the meantime the distribution of DM data would increase with the spread of CALS/EC. They organized "Society for Optimal Road Design" in which people concerned in industries and universities participated including himself, grappling with research subsidy projects of Japan Construction Information Center (JACIC). Through these, they have been examining the linkage between OHPASS and the draft of specifications for conversion of expanded DM-SXF, OHPASS and 3D CAD, as well as "OHPASS" and "UC-win/Road". "I would like to add landscape elements to the assessment items of OHPASS and prove that, for example, when the alignment changes it is also reflected in the landscape. To do so, linkage with 'UC-win/Road' was considered to lead into a great step forward." Associate Professor Motoya Yamasaki stated, with respect to the aim of adopting "UC-win/Road", a 3D real-time VR tool, among several options assumed for visualization. Then he continued that since he had started to actually use it for a series of joint research in the spring 2007, he realized a high level of its function and reproducibility as a tool to support route search, e.g. in expression of topographical data or linkage with aerial photographs. Verification has been made so far about the data linkage between "OHPASS" - "3D CAD" - "UC-win/Road". However, in order to spread this mechanism itself in the future, it is essential to further expand "3D CAD" capable of supporting it. Therefore, the next step he expects is to strengthen the linkage of these three again. Although it was able to represent landscape by means of VR based on the alignment searched with OHPASS as a first step, it is impossible to reflect the selected product in a plan unless there is a function to evaluate whether it is a good or bad alignment. Accordingly, he also paid attention to the addition of function to evaluate landscape systematically, as another aspect of development of the linkage of OHPASS with VR. New Development of Research Derived from Application of "JHDM"
"To tell the truth, there is another task I have been working on since I was in NEXCO Nakanihon. That is 'JHDM', which we also would like to incorporate into our research for the future." "JHDM" is what Associate Professor Motoya Yamasaki has been involved with for its construction since he was working in JH Laboratory. 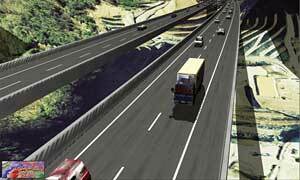 As CALS/EC came to be introduced more rapidly, attempts were made to find out approaches to enable data usage among different types of systems across different phases of a highway project. In that process, especially in a highway project, it was required to make the most of data as meaningful ones such as quantities of works and material specifications. It was the idea of "data model" that drew attention as one of the solutions. This led into the construction of "JHDM (Japan Highway Data Model)", specifications for converting data models taking account of later reuse of the data. At present, it is said that a joint research with a private company is starting in order to apply this to Pavement Management System (PMS), which aims at conducting maintenance and renewal of road pavement efficiently and effectively, serving as a specific example of making a good use of Japan's first highway data model. Moreover, with respect to PMS, it is planned to develop a riding comfort evaluation system, which can be equipped with a simple measuring device that effectively measures flatness or IRI (International Roughness Index). Since the driving simulation function will be a key in this context, new possibility of VR can be expected. "In my understanding, JHDM is a basic idea (for the position of a series of research), which develops into specific application cases such as OHPASS or the riding comfort evaluation system." For Associate Professor Motoya Yamasaki, efforts on diverse tasks relating to construction CALS/EC made about 10 years ago can be expressed as the origin to start his career as a researcher. In this sense, he wishes that JHDM will bring about useful application cases in the new framework of CALS/EC and make contributions. In addition, he hopes to throw his energies in further realization and dissemination of the research products based on a hard look at its marketability abroad. We are most grateful to everyone involved for spending time with us for the interview.